A tasty and delightful dinner loaded with flavor and delicious ingredients! Fresh asparagus is mixed into a fabulous meal loaded with bacon, parmesan cheese and creamy alfredo sauce. This will become a new family favorite! 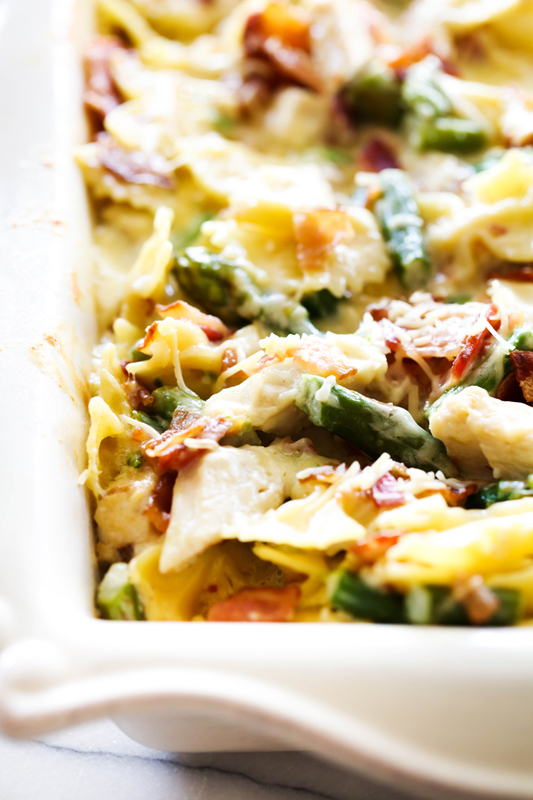 Tis the season for asparagus and this may be my favorite new recipe to use it! This meal is packed with insanely delicious flavor. 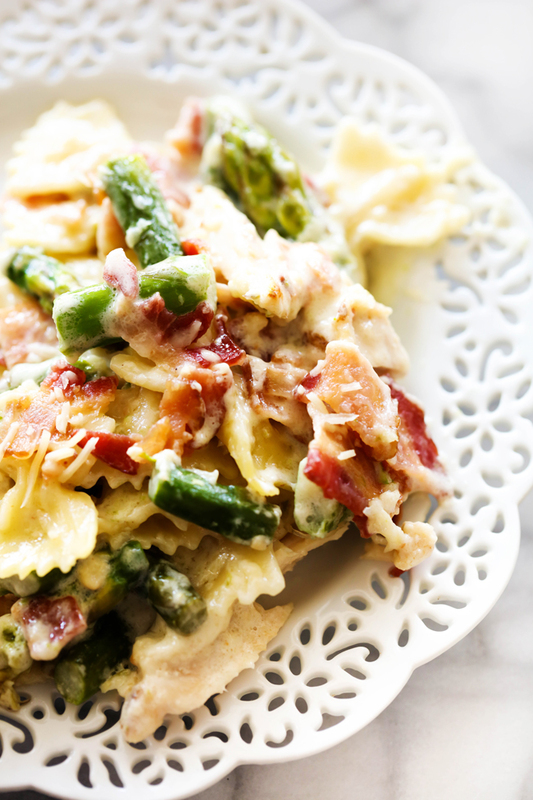 The asparagus, bacon, parmesan cheese and creamy alfredo sauce really knock this meal out of the park! 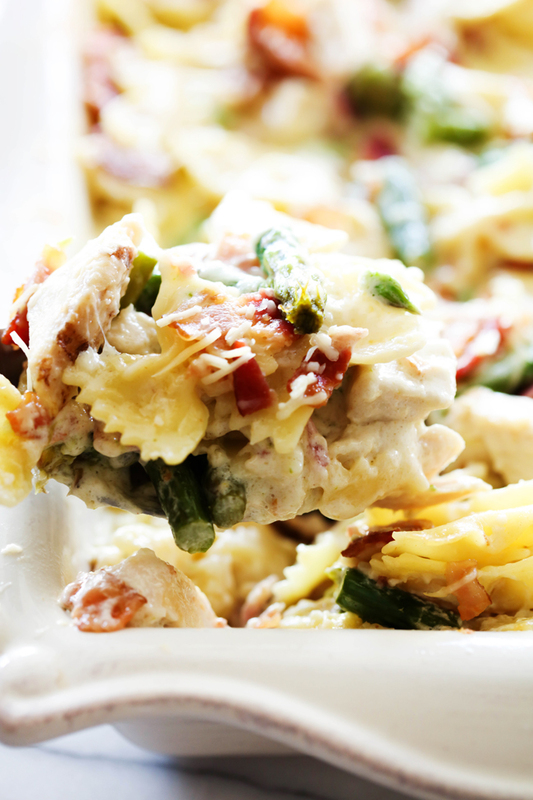 This was a huge hit with my entire family, making this recipe classified as a winner. My husband, in particular, could not stop RAVING enough about how yummy it was. I am pretty sure he went back for 4 helpings of it. My kids gobbled it up almost as fast as it hit their plates. That is saying something because one of them is an extremely picky eater. Asparagus is one of my favorite vegetables and I have a few really tasty recipes coming up that I am excited to share with you, today’s been one of them. If you are looking for an incredible new dinner that your whole family will love and appreciate, give this one a try! You will not regret it! A tasty and delightful dinner loaded with flavor and delicious ingredients! This will become a new family favorite! In a medium sauce pan over medium heat, melt butter. Add garlic, cream, half and half, pepper and salt. Bring to a low boil and reduce heat to medium low and simmer for 4 minutes. Remove from heat and stir in 2½ cups Parmesan cheese. Set aside. Fill a large pot ¼ full of water. Bring to a boil and add asparagus. Boil for 4 minutes and drain water off asparagus and set aside. Spray a 9x13 inch baking dish with vegetable spray. Place pasta in baking dish. (I did not use all of the pasta). Stir in sauce, asparagus, and bacon. Top with ½ cup fresh Parmesan cheese. Cover with foil and bake at 350 degrees F for 30 minutes. Errm, yes please! Pasta is the best and it sounds so delicious to combine it with asparagus! I love the comment about your husband: it always makes me so happy when my boyfriend is raving about dinner so I can totally relate. That pasta looks so creamy! It's making me hungry!